June 7, 2016, 10:53 a.m. 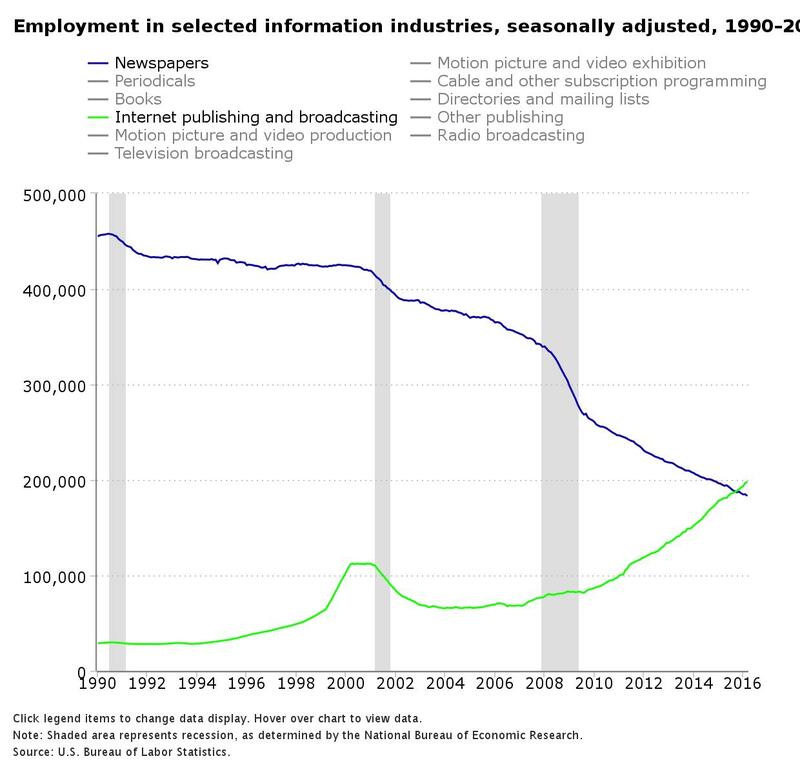 There are now more Americans working for online publishers and broadcasters than for newspapers, according to data from the U.S. Bureau of Labor Statistics. Employment at online outlets first eclipsed newspapers in October 2015. 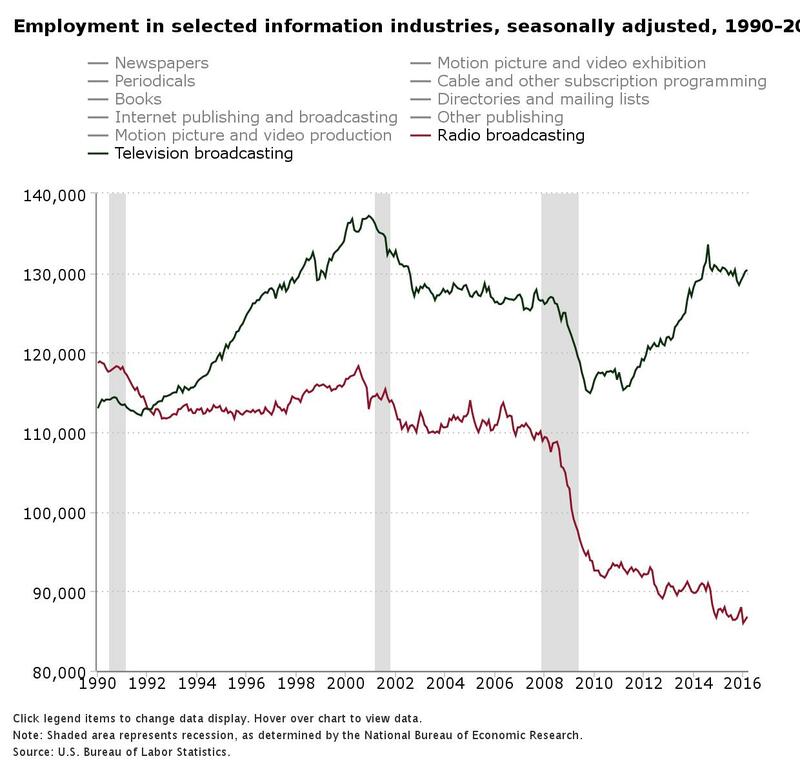 The BLS data goes back to 1990, and since then employment at newspapers has fallen by nearly 60 percent, having peaked in June 1990 at 457,800 people. The number of newspaper jobs has fallen consistently since then. Digital publishing, meanwhile, has grown considerably. Throughout much of the early 1990s there were around 30,000 online publishing jobs, though that figure grew to 112,000 by 2000. Then the dot-com bubble burst and the number of jobs shrunk by about half. 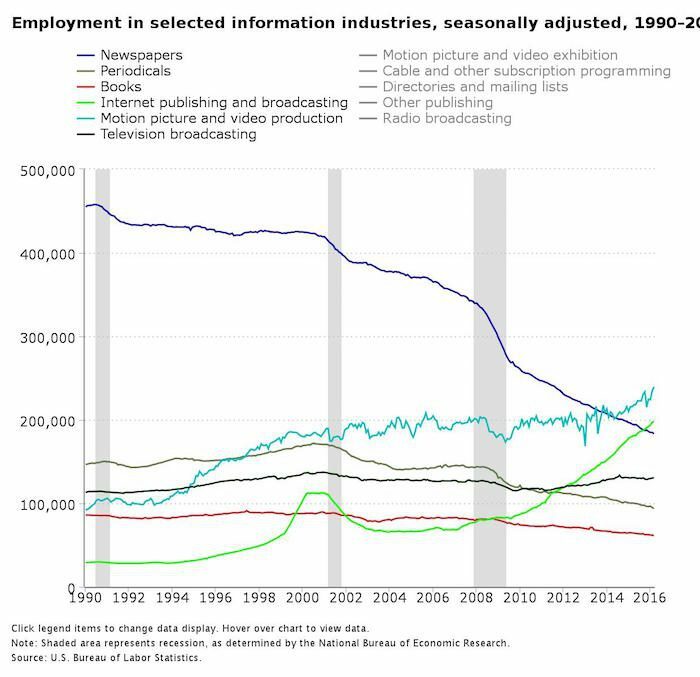 Online-only publishing jobs picked up again in the late aughts, and continued to grow during the aftermath of the 2008 financial crisis. The number of jobs has more than doubled since then. It’s safe to assume that newspaper jobs will continue to evaporate. Most small and mid-sized metro papers are struggling to find new revenue as print advertising and circulation decline and online advertising fails to make up the difference. 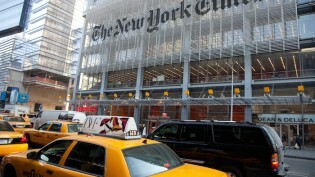 Even large national newspapers, such as The New York Times, are still figuring out to adapt as the internet age. The Times has more than 1 million digital-only subscribers, and it has goals to reach $800 million in digital revenue by 2020, but Vanity Fair reported that the Times is planning at least 200 newsroom layoffs early next year. Many are also questioning the sustainability of online-only business models as well. The Financial Times reported this spring that BuzzFeed cut its 2016 revenue projections in half after it missed its 2015 goals (BuzzFeed disputes the specific totals). Mashable cut 30 jobs in April and has dealt with an exodus of a number of other journalists after it decided to shift its focus toward video. While newspaper job losses have been the steepest, other sectors have also seen decreases in job numbers. Employment at periodicals fell 37 percent from a peak of 150,100 in December 1990 to 93,600 in March. Radio broadcasting jobs fell from January 1990 to March by about 27 percent. As of March, there were 130,400 Americans working in television broadcasting. The full data set is available here. Lichterman, Joseph. "There are now more Americans working in Internet publishing than for newspapers." Nieman Journalism Lab. Nieman Foundation for Journalism at Harvard, 7 Jun. 2016. Web. 19 Apr. 2019. Lichterman, Joseph. "There are now more Americans working in Internet publishing than for newspapers." Nieman Journalism Lab. Last modified June 7, 2016. Accessed April 19, 2019. https://www.niemanlab.org/2016/06/there-are-now-more-americans-working-for-online-only-outlets-than-newspapers/.